My name is Tatiana Chulochnikova and I own Sacred Birman cattery named Bonbon Azur or «little blue-eyed sweeties» (a sort of free translation from French). When in 2003 I decided to take a purebred cat my sight was caught by breed of remarkable beauty, surprising character and a sound health. They somehow reminded me of our former Himalayan cat Zhuzha. Unfortunately we lost Zhuzhka when she was 9 years old. It was the terrible pain but since then I could not live without cats anymore. After long study of breeds I was conquered by cats with surprising blue eyes, in white gloves with soft and tender character. These cats were Sacred Birmans. There were not (and still are not) too many Birmans in Russia. For my first Birman kitten I had to go to Swiss cattery “von Achor ”. I could not leave there from with only one kitten Vikugna. Surprising eyes of another small white creature which I at once called “Belka” looked at me in hope. In Russian Belka means both “white one” and “small squirrel”. So the first Birman kittens in our home appeared in the summer 2004. Many thanks to Gabriela Kamber who has believed me and gave away such remarkable kittens to Russia. Cattery Bonbon Azur*RU was registered with FIFe in 2004. Now cattery is already independent enough. I am the member of Rebuss club, Latvia. Kitties keep participating international FIFe shows in different countries. We've brought up 3 European Champions FIFe. 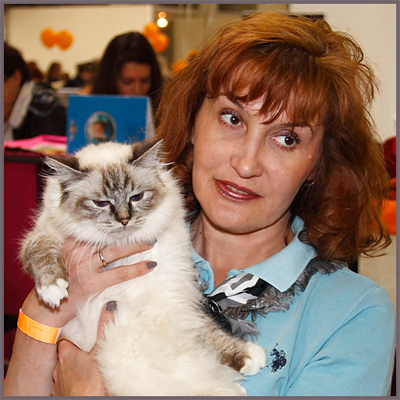 Our breeding program is based on the best lines with the main goal to get classical type of Birmans: even longer body with strong boning, silky birman coat (semi-long), right proportion of the head and wonderful Birman eyes expression. The more fond I become of these remarkable cats the more strong I feel the responsibility for them, for their health and mood. Birman cats cannot "be planted", it is necessary to become related to them, to live and always to remember that the beauty of your cats is a reflection of your care in their unfathomable blue Birman eyes!